Outlasts heat pumps or gas heaters by over 10 years! Solar Pool Heating is the most popular form of swimming pool heating available, with over 60% of pools in Australia heated this way. The reasons are simple…it’s the cheapest form of pool heating to buy, the cheapest form of pool heating to run, and outlasts heat pumps or gas heaters by over 10 years. Sunbather flexible strip solar pool heating is the most popular type of solar, occupying over 90% of the Australian market. With a track record of over 40 years, Sunbather Strip collector is the most flexible, versatile, and best looking solar under the sun and has the awards list and 15 year warranty to prove it. Getting around Air-conditioning units, PV solar panels, and skylights is no issue for Sunbather HiPEC, making Sunbather a preference for the trade and clients. 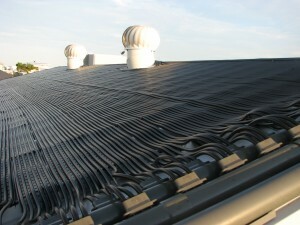 Read more about Sunbather HiPEC and Rigid Suntube solar pool heating systems.